In October 2002, the Danish capital, København, got its first metro line running fully automated from east to west. This construction project was combined with a major city development called Ørestad in the south of the city. The line has two branches on the eastern side, one south to Ørestad and the other south-east to Copenhagen's Airport (Lufthavn). The first phase (taken into service on 19 Oct. 2002) includes the sections Nørreport - Ørestad - Vestamager via the city centre and the south-eastern branch as far as Lergravsparken. Two more stations, Forum and Frederiksberg, were added on 29 May 2003. 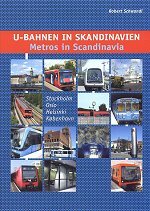 On 12 Oct. 2003, the metro reached Vanløse (Flintholm station opening in early 2004). The line runs 20-30 m underground for 9 km, with 9 underground stations (61 m long, 20 m wide). All stations have elevators and escalators and platforms are separated from the tracks by a glass wall and screen doors. Between Frederiksberg and Vanløse the line follows an alignment formerly used by S-trains. A new interchange station was added to the project at Flintholm to provide transfer to the new S-Tog ring line. The third phase of the metro project is the so-called Østamagerbanen, the 4.5 km link between Lergravsparken and the airport (Lufthavnen). Although initially planned to run on an elevated structure, it was finally built partly at grade and partly in an open cutting. With the opening of this extension in September 2007, the metro network has reached a total length of 21 km. The metro has a fleet of 34 trains, each with 3 walk-through cars, 6 doors on each side, 100 seats in a total capacity of aprox. 300 passengers a train. For the first five years the Copenhagen Metro will be operated by Ansaldo Trasporti, a partner of the Ørestad Company and builder of the trains and railway installation. 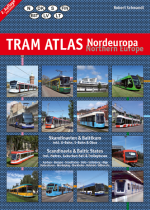 Nørreport provides interchange to Copenhagen's S-Tog system (a commuter rail system operated by DSB - Danish State Railways) which runs rather like a metro within the city. 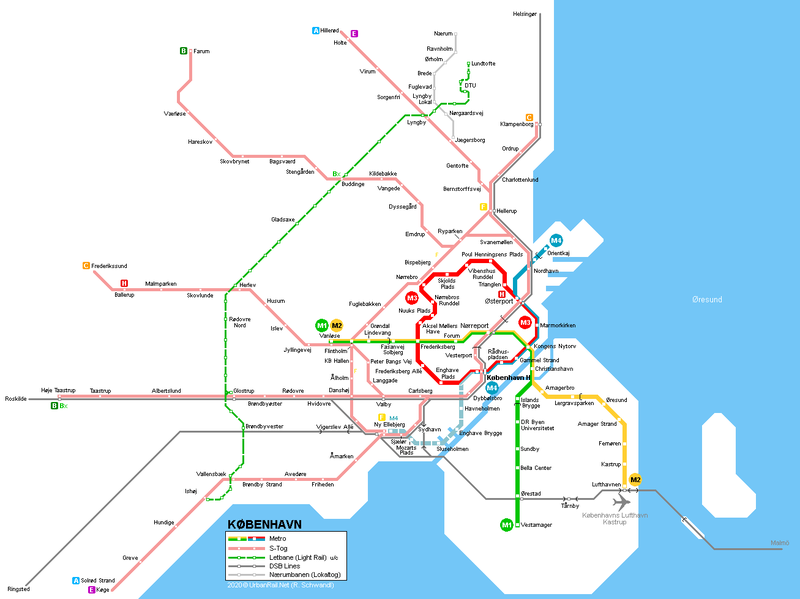 A new line was proposed in July 2000 which would be a fully underground ring line (M3/M4) linking the central station to Kongens Nytorv, Østerport, Nørrebro and Frederiksberg stations. The definitive alignment was approved in November 2005, and later a northern and a southern branch were added to the project. The full 15.5 km circle line (M3) will be opened in July 2019. Basic parameters for stations and trains will follow those applied for the present metro. The branch from Østerport to the redevelopment area at Nordhavn, with an elevated terminus at Orientkaj, is set to open at the end of 2019, while the southern branch to Ny Ellebjerg will start construction in 2018 for completion in 2024.